Passionate about the love of God revealed in Christ through the power of The Holy Spirit. Fr. John Amsberry is the pastor of St. Joseph the Worker in Portland, Oregon. 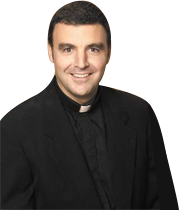 Ordained in 1997, Fr. John has spread the Good News of Jesus the United States, Canada and beyond for over 20 years. He served for 2 years on the National Evangelization Teams reaching out to youth with the Good News of Jesus Christ. A favorite around the country, Fr. John is passionate about the love of God revealed in Christ through the power of The Holy Spirit. Dynamic, faithful to the church and on fire, Fr. John has a heart for evangelization.